Real time reading of measurement, thread formulae evaluation, max and minimum value automatic detection. Gage and instrument data are stored into the software to comply with norms requirements. MicroNet allows to certify gages and instrument and to issue the calibration report directly into Excel. Software can work in network environment and data can be shared through multiple installations. To periodically measure solid gages and instruments (variables). Data acquisition is done via keyboard, from RS-232 (enquire for driver availability) or directly from the measuring system Joint Instrument DMS 680. MicroNet contains some of the measurement procedures for solid gages and for the instruments (comparators, micrometers, calliper, bore gage, etc.) according to the more common practices and standards used in the mechanical industry. All measurement procedures might be changed and customized by the user or created according to company specifications. The software guides the operator through the measurement procedures and calculates the instrument limits in terms of maximum error, error at each step, hysteresis and repeatability of the measurements. The measurement activity is easy, repeatable and conforms to the prescriptions of the norms (ISO 9001, ISO/TS, etc.). 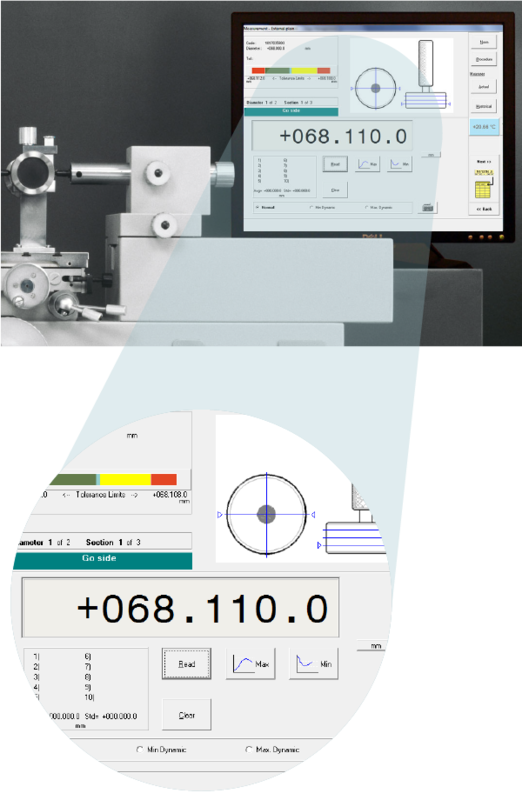 During the measurement process, the software records all data necessary to achieve a correct metrological traceability: date, operator, machine used for the inspection, master gage and measuring tool (if any). Thread solid gage measurements procedure, provides pitch diameter automatic calculation. At the end of the measurement all required data are stored in the record and the due-date is automatically updated. Calibration report printout is provided. Gages and instruments are recorded into the system so to be actively managed in accordance to the needs of the quality system. Other descriptive data are available such as producer, supplier, purchase cost and other fields customizable by the user. The management module includes a searching component that find codes using different criteria between which the due date, location, size, type, usage and many other data. Measurement history is provided, with list of all acquired data as well as all the information required for a correct metrological traceability. 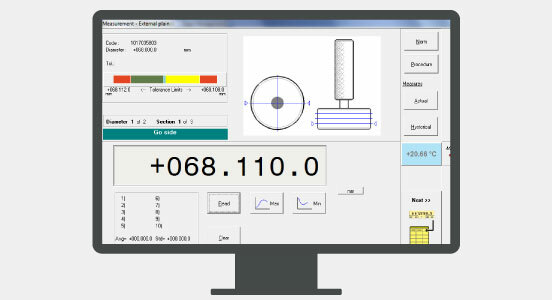 MicroNet allows to manage the measuring tools required for the measurement procedures, the machines and the master gage, with due date automatic notification. Data might be both displayed in metric or inches mode. Operating system: Windows 10 (other on request). Network environment: MicroNet software works in network environment (addition licenses required). Certificates output directly into Excel format. Export in different file format: Excel (xls), Acrobat Reader (pdf), etc. Norms and Standards: Tolerance calculation according to ISO/R - 1938, ISO 261, ISO 262, ISO 286, SO 965/1, ISO/R 1502, ANSI/ASME B1.13M, ISO 965/1, ANSI/ASME B1.16M-1984, ANSI/ASME B89.1.6M-1984, Gagemaker's Tolerance Chart, ANSI/ASME B.1.1-1982, ANSI/ASME B1.2-1983, ANSI/ASME B.1.20.1-1983, ASME B1.20.5-1991, ISO 228, ISO 7, DIN 5480, BS 919, BS 84, ANSI B1.9, BS 1657, NF.E.02-202, etc. . 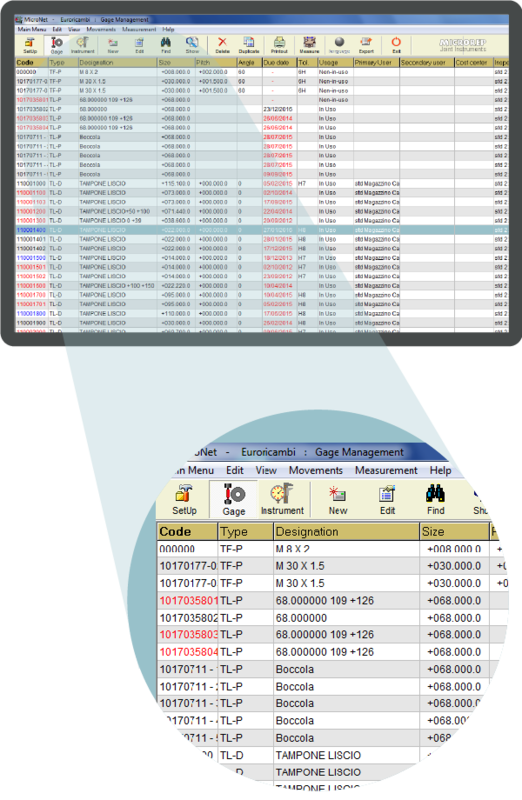 Integration: MicroNet software can be integrated with other software packages through SQL queries, etc.